There is a subtle, dangerous and perilous movement roaming about, raising voices for a false unity between Islam and Christianity. 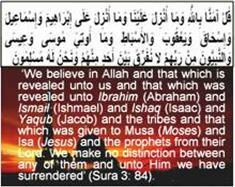 It is called Chrislam, claiming to share the same God, the prophets and the Truth. The idea behind it is to relativize all differences for the common good to create a utopian society. Interestingly, here are some Muslims also propagating it and yet after a glance, one finds that they are only involved so to take advantage of preaching and propagating their faith. Pick up any program organized by interfaith or by Muslims in the USA, in the name of interfaith, and you will find them teaching Islamics at the expense of others. The agenda is to bring Jesus to the level of Muhammad and then convince participants, that like Jesus, Muhammad should be accepted by Christians as the prophet of God. As ambassadors of the crucified and risen redeemer, Christians have a message to deliver to all everywhere. Thanks be to God for the freedom we still have available in the USA that we can still share the message and even search and choose. According to Wikipedia, 76% of the USA is Christian. I am sure, like others, all of us are concerned with the evil of terrorism. If we want Muslims to stop terrorism, let us, along with other precautions, not forget the ultimate calling; to share the Good News of Jesus with them. Share with them the assurance of eternal life that God gives to us all, through Jesus, the Christ. Such an interpretation is taught to Muslim children in the mosques and Islamic centers even in the United States of America. Part of the Islamic faith is to believe in Abraham and all the prophets and their scriptures and do not make any distinction among them (see Sura 3:84). Yet Muslims do make a distinction by claiming that the Bible is corrupted. They claim to believe in Jesus and yet hate the Jews, not even for a moment thinking that Jesus, as a human being was a Jew. Every day in their prayers, Muslims also recite a special prayer dozens of times; asking God to bless Muhammad and his descendants, as he has blessed Abraham and his descendents. Ironically, the same Muslims, not for a moment, question their intention to destroy the descendents of Abraham, including the Israelites, who are Jews. What a contradiction! I thank God for someone like you sharing the gospel with me. I thank God for the Bible being available to me in my language and for the Christians who spent many hrs in conversation with me, answering questions about Jesus. Help your Muslim friend to read: “The LORD had said to Abraham. “I will make you into a great nation and I will bless you; I will make your name great, and you will be a blessing. I will bless those who bless you, and whoever curses you I will curse; and all peoples on earth will be blessed through you” (Geneses 12:1-3. Promise repeated in 15, 17 and 22). Someone (following the Messiah, Jesus) distributed copies of John’s gospel and one reached me. Today when I look back, it was then that the seed was sown in my life. If you want Muslims to stop terrorism, why not reach them with the message of Jesus? Otherwise how can you expect a Muslim to stop hating Jews and Christians, when 5 times daily, he is reminded of it in his prayer? As a Muslim, I believed in Jesus but hated Jews and Christians also. Well, Jesus was a Jew. Then I read in the Qur’an: Believe in Abraham and the Prophets; Moses and Jesus that led me to read the Bible. – Thanks be to God for his grace, mercy and assurance available to me through Jesus, who I found to be more than a prophet!